I always wondered about this spring. It looks too big in brochures to have been made private, but I guess not. It looks like a nice spot of old Florida! I remember swimming there as a kid. I remember finally getting enough guts up to slide down that huge slide. 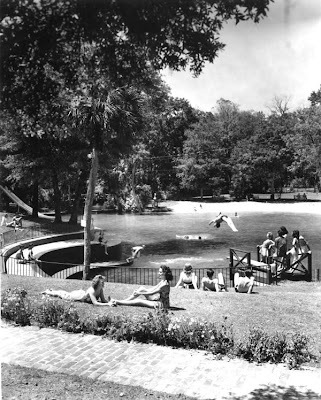 I hope they have preserved this wonderful natural spring, and still allow the residents swimming access to a great swimming hole. I grew up in the springs. It was a great place to live. It is still a beautiful place. Our family visited SanLando Srings from the East Coast on a regular basis when I was a kid. I remember the slide, beautiful flowers, palms, and clear, very clean springs. We loved it then; wish it hadn't gone private. It's one of the springs that had shallow areas for little ones and deeper areas for the rest without a sharp drop off. Beautiful place! 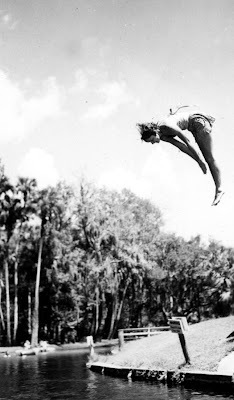 I grew up in Cocoa (East coast), and went to Sanlando Springs on high school senior party in 1960. It was a great treat. I also went to Sanlando Springs on the high school senior party from Cocoa High School in 1960 -- small world! It was a great place for the outing - beautiful water, giant slide. 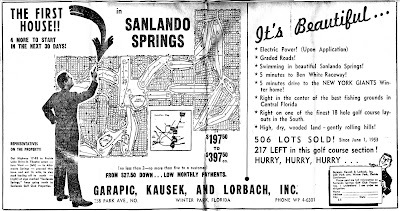 I lived at Sanlando Springs in the 1950's. My father, Bob Davenport was employed by Mr. Robinson as a nurseryman/grounds manager. Beautiful springs and grounds. I learned to swim at the springs. I was a life guard for two years at Sanlando Springs. The ultimate summer dream job for a college student. It was so beautiful. I would love to go back and just take it all in. Patricia- I'd love to know more about what it was like working there! Friends and I spent many happy teenage days swimming and sliding there in the 60s. Sad to see it private. My family grew up going to the springs. My father, use to give diving exhibitions there in the 40's. My brother got us in the Springs about 5 years ago and it was very sad. We were the only ones there. I wanted to cry at the loss for Orlando families it was such a beautiful place with so many great memories. 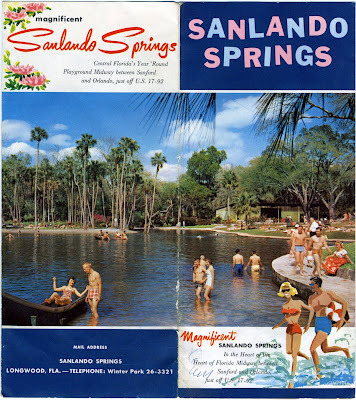 Sanlando Springs was the place to go for young teenagers during the weekends and Summer months of the 1950's and 60's. A trip to Sanlando followed by a meal at Steak & Shake was "Heaven on Earth." Growing up in the Orlando area, I spent many happy times there. One of my fondest memories were the times Mr. Rumpf, our band director, would take our band, William R. Boone High School, to the Springs for our yearly retreat. I also remember the TV movie prop village where they filmed some of the "Gilligan's Island" show. The walkways around the springs were beautiful and the memories of walking old girlfriends around them are precious memories that are cherished today. As an Orlando native and 1960 Boone graduate, I can attest to your description of Sanlando Springs. It was heaven on earth. Now tops on my bucket list is visiting all the springs in Florida if possible. A noble quest. There are close to 1,000. Good luck! We lived in Melbourne and I remember my parents taking me and my sisters to Sanlando Springs a couple of times a year for many many years in the early to late '60's. It was always a fun and relaxing place. I remember how cold the water was and how I use to snorkel there since the water was so clear. And the pool was pretty cool too. We always use to go see a big tree nearby afterwards. Don't remember where it was or what kind of tree it was. I would like to know what happened to that tree. Great memories as a kid growing up. So sad to hear it is closed to the public. The big tree you refer to was most likely a huge cypress in Longwood. It was in a park there. I say "was" because it was set on fire by a "druggie" just last year while she was attempting to smoke her drugs. Sanlando Springs was where I learned to swim when I was 8 years old. I loved going there as a child! wonderful memories! A lot of Saturdays spent at Sanlando Springs, mom worked at the Chocolate Soldier bottling plant on 434 also and during the summer, she would drop us off there and pick us up when she got off work. The Trampoline's next door were fun also. For those that don't remember, chocolate soldier was a bottled chocolate drink. The Big Tree was a Sunday visit now and then, with a stop on 17-92 for a drink of spring water which flowed out of a pipe in the ground. They have capped the pipe. I grew up in Winter Park in the 50's & 60's. I also learned to swim in the springs. Our family spent many enjoyable days there. I remember the trails which seemed to go on forever. I never jumped in the water along the trail (no swimming area) but sure wanted to. One day while walking on the trails friends & I found the old pool. It seemed to me that after The Beachcomber came & dug up & destroyed alot of those trails Sanlando was never the same. I lived in the Apple Valley subdivision as a kid in the 80's. We snuck into the springs daily via the Little Wekiva river where it goes under the 434 bridge. Great place to swim. Rope swings.. trees to jump out of.. Super fun!! I remember swimming there when I was in my teens that was then 1977. I was wondering what that was because when we swim there it was just a tiled wall and then down into the spring. Everything else was overgrown and there was no evidence of any buildings walkways or anything else. It was completely overgrown. Very few even knew that it was back in the woods. My parents took us here in the 50's a couple of times for vacation. Wonderful memory.